Bob Zimmerman reports on the latest space news during regular weekly slots (usually Tuesday and Thursdays) on the John Batchelor radio program. See the iTunes free Podcast for links to the latest shows. On this week’s Hotel Mars segment, Jeff Foust talks with David Livingston and John Batchelor about the recent Antares Orbital Sciences launch and about the NASA commercial cargo and crew program: John Batchelor Hotel Mars, Wednesday, 5-1-13 – Thespaceshow’s Blog. The Planetary Society‘s weekly Hangout yesterday included Dante Lauretta, the principal investigator of NASA’s OSIRIS-REx Mission , which will take off in 2016 on a mission to visit the near-Earth carbonaceous asteroid (101955) . The show also included Mike Puzio, age 9, of North Carolina who won the OSIRIS-REx Name That Asteroid contest (see earlier posting). Commercial space was on the agenda (pdf) during the University of Nebraska–Lincoln space law program this week: Space travel one of many topics at Lincoln space law conference : The Lincoln Journal Star Online. Kristian von Bengtson of Copenhagen Suborbitals gives an update on the wind tunnel testing of a model of their Tycho Deep Space II capsule and the modifications they have made to its design: More Winds – More Testing -Wired Science/Wired.com. Here’s a report on the Estonian cubesat project ESTCube, which will test the E-sail propulsion concept from Pekka Janhunen of Finland: Electric Space Sail to Get Its First Test – IEEE Spectrum. They describe Bandella as an unlikely band of NASA astronauts with Chris Hadfield currently in space (guitars, vocals, first Canadian Commander of the ISS), Micki Pettit (lead vocals, wife of Don Petit, the first to enter the SpaceX Dragon capsule in space), Cady Coleman (flute, 180 days in space so far) and other stars who drift into nearer-earth orbit. Here are some pictures of the event: Earth Day Serenade from Space – Flickr. The MOOC Production Fellowship competition will provide 25000 Euro to each of the ten winning MOOC (Massive Open Online Course) programs out of the 200 that have entered. The winners will be determined by online voting. Anyone may vote for the contestants until May 23rd. The winning courses will be offered for free at the iversity online learning site. I received a message from Department of Aeronautics and Astronautics at Berlin, Institute of Technology about their Space Technology entry in the competition. The course has no prerequisites “other than a basic understanding of maths”. The course “Space Technology” covers the fundamentals of space engineering, as well as further related subjects like space law, space politics or management of a space project. At first, a brief introduction of our solar system and the space environment will give an idea about the destination space. On a trip to space, one has to expect an extremely harsh environment with vacuum, zero-gravity, deadly radiation, micrometeoroids and extreme temperatures. Still, space engineering enables spacecraft and humans to survive under these conditions. Most of today’s space applications are based on satellites. Therefore, a focus will be set on satellites and their subsystems. Here, subjects like mechanical structures, thermal control, electrical power systems, attitude determination and control, data management and communications will be introduced using a mixture of theory and real mission examples. One of the most fascinating sectors of space technology is human space flight. A section will be devoted to human spaceflight. In this section several topics like life support systems, astronaut training and space stations will be addressed. I recently pointed here to the International Space Apps Challenge program, which aims to encourage “collaborative problem solving with a goal of producing relevant open-source solutions to address global needs applicable to both life on Earth and life in space”. Stephen Murphey interviewed one of the competitors, Pablo Carranza Vélez, about his project, which involved “using the Raspberry Pi to create a space worth redundant computer”: How the International Space Apps Challenges Creates Innovation – DIY Space Exploration. 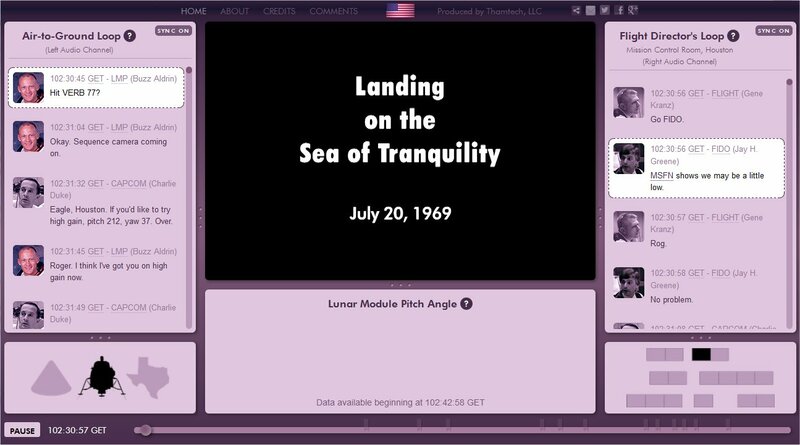 an online interactive featuring the Eagle lunar landing. The presentation includes original Apollo 11 spaceflight video footage, communication audio, mission control room conversations, text transcripts, and telemetry data, all synchronized into an integrated audio-visual experience. Until today, it has been impossible to comprehensively experience mankind’s shining exploratory accomplishment in a singular experience. We have compiled hours of content available from public domain sources and various NASA websites. Thamtech staff and volunteers generously devoted their time to transcribe hours of speech to text. By using simultaneous space and land based audio and video, transcripts, images, spacecraft telemetry, and biomedical data—this synchronized presentation reveals the Moon Shot as experienced by the astronauts and flight controllers. WASHINGTON — NASA is inviting members of the public to submit their names and a personal message online for a DVD to be carried aboard a spacecraft that will study the Martian upper atmosphere. The DVD will be in NASA’s Mars Atmosphere and Volatile Evolution (MAVEN) spacecraft, which is scheduled for launch in November. The DVD is part of the mission’s Going to Mars Campaign coordinated at the University of Colorado at Boulder’s Laboratory for Atmospheric and Space Physics (CU/LASP). “The Going to Mars campaign offers people worldwide a way to make a personal connection to space, space exploration, and science in general, and share in our excitement about the MAVEN mission,” said Stephanie Renfrow, lead for the MAVEN Education and Public Outreach program at CU/LASP. “This mission will continue NASA’s rich history of inspiring and engaging the public in spaceflight in ongoing Mars exploration,” said David Mitchell, MAVEN project manager at NASA’s Goddard Space Flight Center in Greenbelt, Md. MAVEN’s principal investigator is based at the University of Colorado at Boulder’s Laboratory for Atmospheric and Space Physics. The university will provide science operations, science instruments and lead Education and Public Outreach. Goddard manages the project and provides two of the science instruments for the mission. Lockheed Martin of Littleton, Colo., built the spacecraft and is responsible for mission operations. The University of California at Berkeley Space Sciences Laboratory provides science instruments for the mission. NASA’s Jet Propulsion Laboratory, Pasadena, Calif., provides navigation support, the Deep Space Network and the Electra telecommunications relay hardware and operations. Pat Hynes urges greater appreciation and support for the ISS: The ISS – Pat Hynes Blog. The Space Studies Institute, whose mission is “to complete the missing technological links to make possible the productive use of the abundant resources in space”. SSI just announced that it is starting a new project with Prof. Jim Woodward of California State University Fullerton: Exotic Propulsion Initiative – Space Studies Institute. , has further heightened interest in “exotic” physics propulsion concepts.